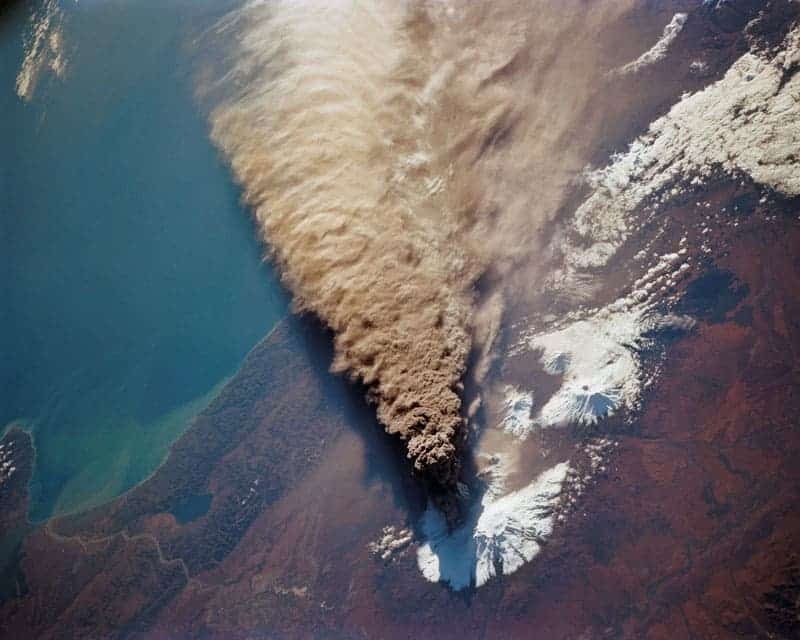 In this incredible capture taken on 30 September 1994, we see a major eruption of Klyuchevskaya Sopka as seen by the astronauts aboard the Space Shuttle Endeavour. It is yet another testament of the immense power that volcanoes have, as the ash rose 60.000 feet into the air (almost 19.000 meters) and spread as far as 640 miles (1,030 km) southeast from the volcano. Klyuchevskaya is a stratovolcano built up by many layers (strata) of hardened lava, tephra, pumice, and volcanic ash. Unlike shield volcanoes, stratovolcanoes are characterized by a steep profile and periodic explosive eruptions and quiet eruptions, although there are some with collapsed craters called calderas. Its first documented eruption was in 1697 – and it’s been active ever since. I know, I know – I’ve posted another GeoPicture this week – but you can never have too many awesome pictures, right?